The left one lets you customize the color of your pin, and the right one controls its shape. 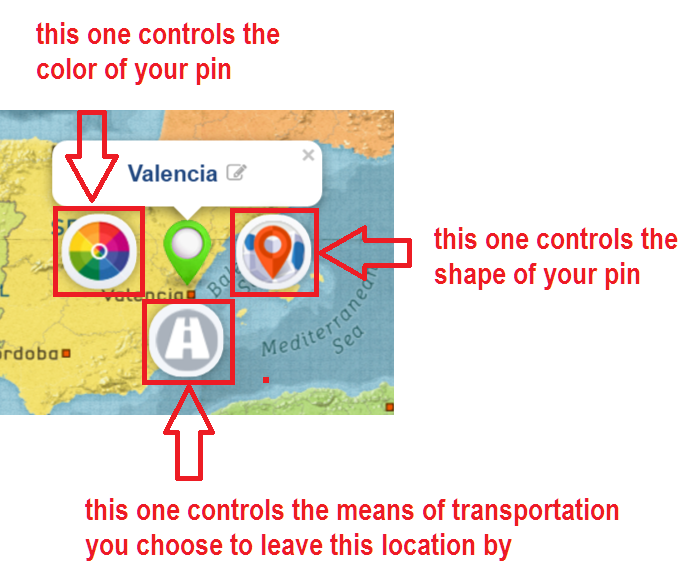 The one below the pin controls the mode of transportation you leave the location in. Come on, try it now. Log in to your account, go to edit a project and click a pin to change its color and shape, or to add a mode of transportation to a location. We’ll let you in on a little-known feature – you can also customize the color of the path between locations. Come on, try it now. Log in to your account, go to edit a project and click a path to customize its color. Thanks for your feedback Sem, glad you like the platform. We develop new features based on user demand – more means of transportation are already on our to-do list. As soon as we have enough demand for bicycle and walking, we’ll add those. In the meantime, you can use the motorcycle instead of a bike – wouldn’t it work for you? Hi Diana thanks you very much for your tips. This app is great and easy to use. It would be good if we have the option to modify the colors of the transportation means, for example, I would like to change the current red color of the car by another one. Thanks and greetings from Chile. Thanks for taking the time to send us your feedback Alejandro, much appreciated! I think you’re the first to ask for such a feature so I’m adding it to the list of requested features. If/when we have enough demand for it, we’ll plan development.